It was not a long way to Croatia, but we set off early because we wanted to stop and visit Mostar and its famous bridge and also because we had not booked anywhere to stay in Croatia, the plan was to get to the coast and then ride north until we found a place we liked and try to find an apartment or a room there, as there is a lot of offer and it should not be difficult to find something. Riding out of Sarajevo we discovered that it is a much bigger city than we had imagined when we were visiting the center, it extended to the south before turning into suburbs and industrial areas and then the hills closed around us again and we were on twisty roads, enjoying the nice weather. After a while the road wound its way into a canyon following a river that further down flowed under the bridge in Mostar. The scenery was amazing, a winding road along an emerald river with majestic grey-white cliffs on both sides. When the canyon finally opened into a wider valley we found the town, or rather city. It was bigger than I thought, in fact it is the fifht biggest city in the country, and as usual, we rode through some uninteresting suburbs before finding the old town. We rode down a cobbled street following the signs that pointed towards the Stari Most until we came to a point where we could not ride any further. I was turning the bike around to go back up the street and find a place to park when a boy gestured me to ride onto a bar’s terrace where there were already four motorbikes parked. It seems the owner of the bar, seeing the country was a popular destination for riders, had smelled business and decided to use the terrace as parking space. We left the bike in the shade and under the eye of the barman for a couple of Euros (that price was for the whole day if we had wanted to stay) and walked a few meters down the street to find the bridge. The first impression was that it was a very crowded tourist spot, there were a lot of people standing on the bridge, so many in fact that it was difficult to make our way onto it, but then we saw the reason so many people had congregated at the same time on the bridge itself and on both banks – a young man in swimming trunks was getting ready to jump off into the ice cold river below. He dosed himself with cold water from a hose to get ready, stepped over the railings, clapped his hands a few times to get everybody cheering and flexed his legs as silence fell over the crowd watching. Then he jumped up and forward, spreading his arms like wings and arching his back as he stood in the air for a fraction of a second before plunging into the river more than 20 meters below. 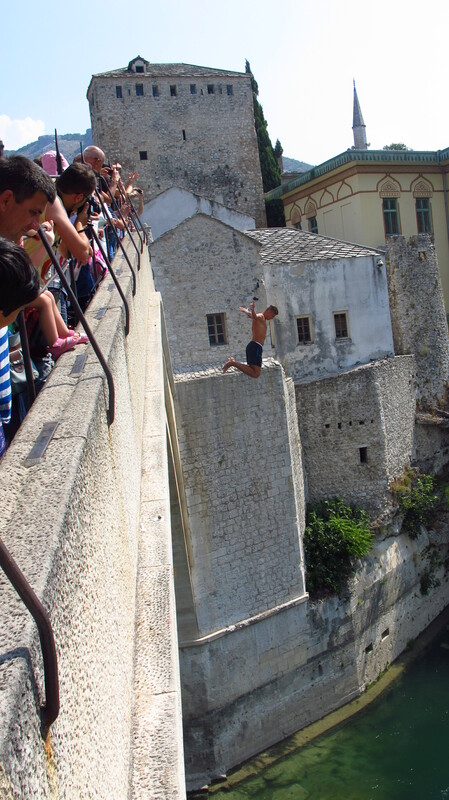 It seems that it is traditional for young men to dive from the bridge into the river, there are formal competitions organized every summer, a diving club in a house by the bridge, and it dates all the way back to the bridge’s construction, in the 16th century. We visited the rest of the old town, including an exhibition with photographs of the city before, during and after the war, and a video of the destruction of the bridge. During the Bosnian war, the town saw fighting between the army of Bosnia I Herzegovina and the Croatian army on one side, and the Yugoslav’s People Army. 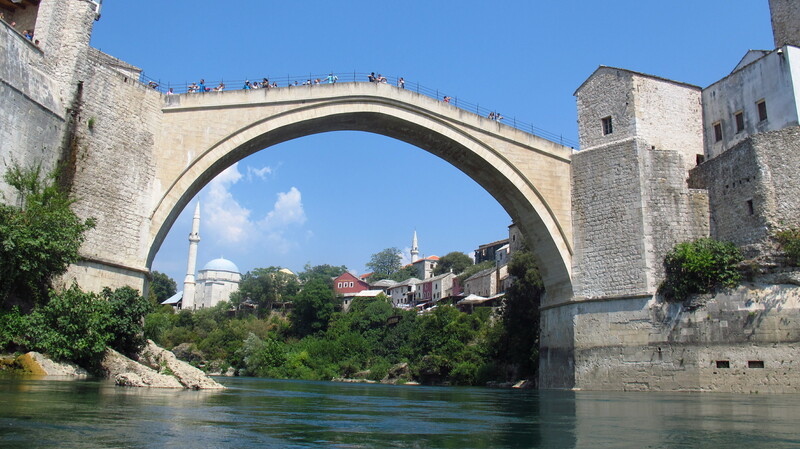 The Croatian army bombed and destroyed the bridge claiming that it was of strategic importance, although the action is mostly considered to be an act against Bosnian cultural heritage. After the war it was reconstructed and it stands as a symbol of the union between cultures in the country. 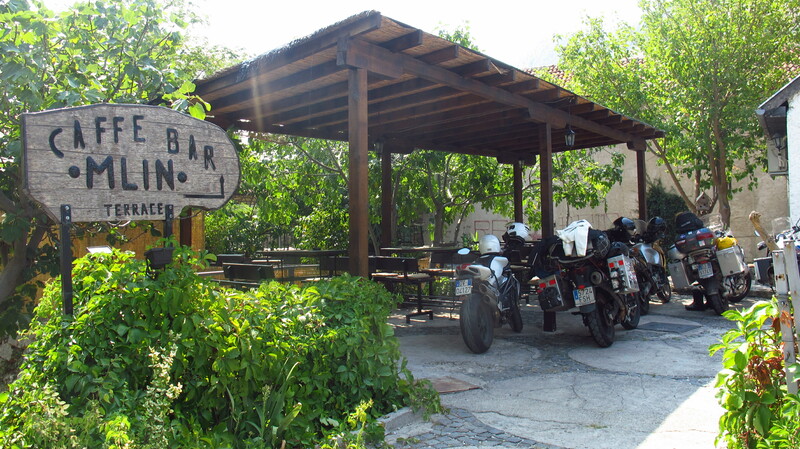 We left the town under the intense summer heat and stopped one last time before crossing the border to spend what we had left of Bosnian money on petrol and a bottle of water; we had some lunch sitting in the shade of some trees by the petrol station and then rode to the border. The crossing was the easiest one I had done outside the EU – I handed the guard the passports, and the moment she saw they were EU passports she waved us through. After a short ride we finally saw the sea, and started making our way up the coast. We had decided to skip Dubrovnik, as it meant riding almost 90km south and then back up again, I had already seen the city and it was swarming with tourists this time of the year, as all Mediterranean cruises call on its port. Instead, we decided to try and get as close as possible to Split. By late afternoon we had made it to Omis, a beautiful fishing town a few kilometers from Split and once a pirate haven, where we tried to find accommodation. The idea was to try and rent a room in the center, so we could walk back to bed if we went out for dinner or for a beer, but all the places where we asked were out of our budget. In the end we rode for just a couple of kilometers out of town and found an apartment with a view to the sea, two minutes away from the beach on foot and with internet connection at a very reasonable price, so we took it for four nights. 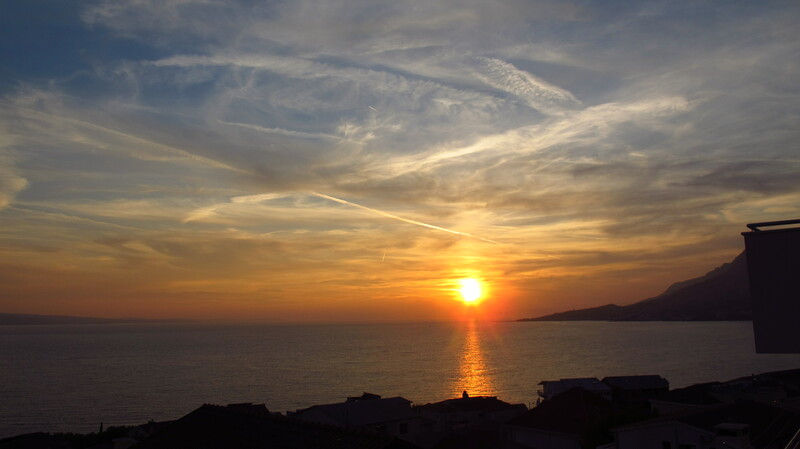 This entry was posted in Stroming The World 2013, Travel and tagged Croatia, Mostar, Omis, STW 2013 by Kilian. Bookmark the permalink.